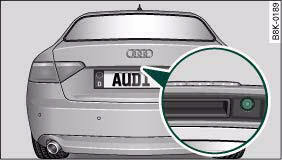 A reversing camera is integrated in vehicles with the Audi parking system advanced, in addition to a parking aid with acoustic signals and graphic display. Two modes can be selected when parking. 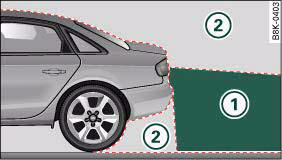 “Parking mode 1” can, for example, be used when parking your vehicle in a parking bay or a garage ⇒ fig. 187. Select “parking mode 2” if you wish to park parallel to the roadside ⇒ fig. 188. The reversing camera covers approximately the area depicted in ⇒ fig. 189 and ⇒ fig. 190 1. This is the area you will see in the picture on the MMI display. Orientation lines and colour markings are projected onto the picture to help you when parking or manoevring in tight spaces. Objects out of range of the camera in area 2 do not appear in the picture on the MMI display. • the vehicle has been loaded with a greater load on the rear. • the sun is so dazzling that you cannot see the image on the display screen. The reversing camera is located above the rear number plate. To ensure that the parking aid works properly, the lens ⇒ fig. 191 must be kept clean. • Moisten the lens using a commercially available, alcohol-based glass cleaning agent and clean the lens with a dry cloth ⇒ . • Use a small brush to remove snow and a de-icer spray to remove ice ⇒ . • Do not allow the camera images in the MMI display to distract you from watching the traffic. • For safety reasons, you should not use the system if the position and installation angle of the camera have been changed, e.g. in a rear-end collision. Have it checked by a qualified workshop. • Please note that low obstacles detected by the system may no longer be registered by the sensors as the car moves closer, so the system will not give any further warning. Certain kinds of obstacles (such as wire fences, chains, thin painted posts or trailer draw bars, etc.) may not always be detected by the system, so take care not to damage the vehicle in such cases. • Never remove snow and ice from the lens of the reversing camera using warm or hot water - danger of cracks appearing on the lens. • Never use abrasive cleaning agents on the lens. The reversing camera is automatically switched on together with the acoustic signals and graphic display when you select reverse gear. – Switch on the MMI system. – Press the switch in the centre console ⇒ page 170, fig. 185. You will hear a brief acknowledgement tone and the diode in the switch will light up. – Press the control button for Graphic, fig. 192 5 to show the graphic display on the screen. – Press the control button for Rear View to display the picture from the reversing camera. • Some objects (e.g. narrow posts or bars), recesses in the ground or protruding parts on other vehicles may not be displayed in a satisfactory manner or may not be displayed at all on the MMI screen. 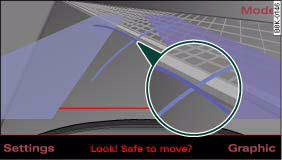 • Only use the reversing camera to assist you if it is supplying you with a good and clear picture. The quality of the picture could be impaired by adverse light, dirt on the lens or a defect (accident risk). • Only use the reversing camera when the boot lid is completely closed. Please make sure that there are no objects mounted to the rear end of the vehicle which could block the view of the reversing camera. 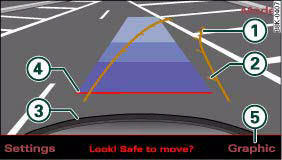 • If your vehicle is near an obstacle, the graphic display will also appear in the reversing camera image. This superimposed graphic helps the driver to localise the critical area of the vehicle. • You can change the display and adjust the volume and pitch of the beeps ⇒ page 177. Parking mode 1 can be used when parking your vehicle in a garage or parking bay. – Turn the steering wheel until the orange orientation lines 1 are pointing towards the parking space ⇒ fig. 192. You can estimate the distance to an obstacle by referring to the markings 2. Each marking is equivalent to 1 metre. 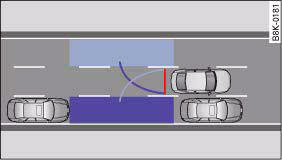 – Reverse into the space and adapt the steering angle to the parking space, using the orange lines to assist you ⇒ . 3 indicates the rear bumper. You should stop reversing, at the latest, when the red orientation line 4 is bordering on an object ⇒ ! – Align your vehicle according to the blue area marking ⇒ fig. 193. The blue marking is an extension of the vehicle outline and reaches about five metres to the rear of the vehicle. The shade of blue changes at a distance of approx. 1 m, 2 m and 5m to the vehicle. 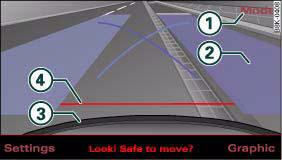 • The reversing camera does not show the complete area behind the vehicle. It is particularly important to ensure that there are no small children or animals near the vehicle, as the reversing camera may not always be able to detect them (accident risk). 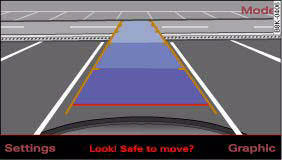 • Please note that objects which are not touching the ground may appear to be further away than they actually are (e.g. the bumper of a parked vehicle, a towing bracket or the rear end of a truck). 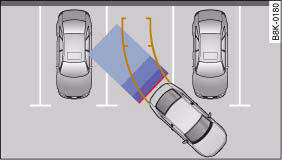 In this case you should not use the orientation lines as a guide when parking the car - accident risk! The MMI display shows the path of the rear end of the vehicle if you were to reverse using the current steering angle. NB: The front end of the vehicle swings out further than the rear. Please make sure you keep a sufficient distance between the vehicle and any obstacles to make sure that the exterior mirror or edge of the vehicle do not collide with the obstacle (accident risk). Parking mode 2 can be used when parking your vehicle at the roadside. The following steps apply only when there are no obstacles (such as a wall) next to the parking space. Otherwise, please follow the “Instructions for parking next to obstacles”. 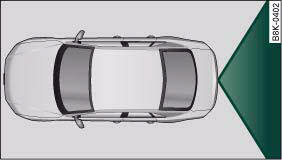 – Position your vehicle parallel to the roadside, about a metre away from the next parked vehicle. – Engage reverse gear. The parking aid will be switched on and parking mode 1 will be displayed. – Press the control button for Mode ⇒ fig. 194 1 on the MMI control console. Parking mode 2 is displayed. – Reverse and align your vehicle in such a way that the blue area marking 2 borders onto the vehicle behind or onto the parking space line marking. The blue marking is an extension of the vehicle outline and reaches about five metres to the rear of the vehicle. The long side of the blue marking should border onto the kerb. The complete blue area marking must fit into the parking space. – When the vehicle is stationary turn the steering wheel to the left as far as it will go. – Reverse into the parking space. – Stop the vehicle as soon as the blue curve touches the kerb, fig. 195. – Continue to reverse into the parking space until the vehicle is standing parallel to the kerb. 3 indicates the rear bumper. You should stop reversing, at the latest, when the red orientation line 4 is bordering on an object ⇒ ! Keep a close watch on the front of your vehicle ⇒ . If an obstacle (such as a wall) is located next to the parking space, the clearance at the side of the vehicle must be larger. Position the long side of the blue marking so that there is sufficient clearance from the kerb. The marking must not touch the kerb. You must also start turning the steering wheel much earlier. The blue curve, fig. 195 must not touch the kerb - make sure there is sufficient clearance from the kerb. The orientation lines and markings appear on the left or right side, depending on which turn signals are on.